After prolonged use electrodes take a toll. Sometimes the needles get bent and they need to be replaced. We are here to help and offer easy to order replacements. Having extra electrodes on hand can be valuable in the classroom setting as well. 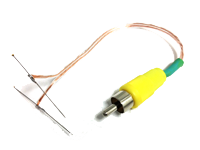 A replacement 1-channel electrode for our standard SpikerBox experiments on crickets and cockroaches.